Bedanji, Chhattisgarh: In the remote rural expanse that could soon be gobbled up by a Rs19,500 crore steel plant, there is iron in the resolve of protesters. “We will not give our land to Tata," says 60-year-old Sankar Das, a frail dhoti-clad Hindu priest, even as he pokes round in a cloth bag during a meeting of village elders. Das produces a letter written by residents of his village, Bedanji, to the district administrator of Jagdalpur in Chhattisgarh’s Bastar region, home to some of the world’s richest iron ore.
“The Kakatiya kings brought and settled us here from Warangal 22 generations ago to worship the goddess and supervise sacrifices on Dussehra," says the letter handwritten by Bedanji residents in Hindi. The Kakatiyas were medieval kings who ruled what is now Andhra Pradesh. But this is the enduring saga of modern India—farmers refusing to give their land to big businesses riding the wave of a booming economy, looking to feed the unending hunger of an infrastructure-hungry nation. Prime Minister Manmohan Singh acknowledged the crisis last week. “There has been a systematic failure in giving tribals a stake in the modern economic system...the alienation built over decades is taking a dangerous toll," he said. “The systemic exploitation of our tribal communities…can no longer be tolerated." And it seems no coincidence that India’s mining heartland is also the Maoist heartland. The Maoists are gaining support due to the decades-old angst over mining, forest rights and land acquisition. And they are spreading their influence, through subtle and drastic measures. In June, a small group of Maoists walked up to the weekly market in Lohandiguda village 340km south of Raipur, and at close range shot dead Vimal Meshram, 42, an influential tribal leader and a very vocal supporter of the Tata project. Then, in full public view, they walked away. “I think the biggest indictment of the mining sector is that it is only about rich lands and very poor people. Naxalites use mining to extort wealth, like politicians," said Sunita Narain, head of the Centre of Science and Environment. “If you map the forest wealth, the mineral and the poverty of India, it’s a complete match." Tribal people make up only 9% of the country’s population, but over 40% of the land used to build development projects was theirs, according to government estimates. 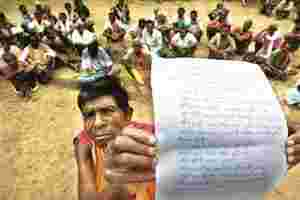 A just-released government report blames the government and companies such as Tata and Essar for a corporate takeover in the hinterland of Chhattisgarh, warning of “the biggest grab of tribal lands after Columbus". “This open declared war will go down as the biggest land grab ever, if it plays out as per the script," said the report, commissioned by the rural development ministry, chaired by the then-minister Raghuvansh Prasad Singh. “The drama (is) being scripted by Tata Steel and Essar Steel who wanted seven villages or thereabouts, each to mine the richest lode of iron ore available in India," it added. Both companies dismissed the allegation. “This is ridiculous…there is a formal memorandum of understanding, the land was allocated, the whole process was done in a legal manner. There is no land grab," Tata Steel spokesman Sanjay Chowdhary told the Hindustan Times. “It is completely incorrect and baseless," an unnamed Essar spokesman said in a statement to HT. “Biased and one-sided…reports like this only contribute towards vitiating the atmosphere, which is only suitable to anti-social, anti-development and anti-peace forces." Still, tribal communities in India’s mining hubs have no stake in the wealth beneath their feet. An October public hearing was done as required under the law by the collector or administrator of Jagdalpur, the district where Lohandiguda is located, to seek villagers’ consent to the Tata project. It was held in a small hall fit for 300 people in the collector’s office, up to 30km away from the villages concerned, citing the Naxalite threat. Entry was restricted on roads from the villages to the office. Several in the gathering were accused by villagers of being government employees pretending to be village farmers. Approval for the project was unanimous, said district collector Manohar Singh Paraste. Many farmers have agreed to sell, the government says. Compensation cheques have been given away to a lot of people, but numerous complaints have also poured in, saying land was fraudulently bought and the money given to unknown people. Paraste denied any wrongdoing or that any government employees sat as decoy villagers in the public hearing, but saw no need for the public hearing to take place among the public. “This is how it has been done in the past, and this is how we will do it," he said. In Takraguda village, not too far from where Meshram was killed in the market, that is not good enough for Badru Ram Nag, 45, deputy headman of the Takraguda village. “We don’t want the money. We won’t give the land," he says. “We have nothing but land. If you take that away, we will die."